Eureka, CA: The first trial of an arrested Occupier (Eureka) is over. The Humboldt County prosecutor's case revolved around the arrest of the demonstrator for videotaping Eureka police officer, Michael Guy, when he approached the Occupy Eureka site at 4am. After officials jailed the person who was filming for eight days, wasted the impoverished county's money, and spent nearly two weeks in court claiming that the videotaping woman's behavior put the officer in grave danger, a jury voted ten-to-two for acquittal. The case was dismissed. Eureka, CA: A jury delivered a resounding victory for plaintiffs in a police misconduct civil rights case by awarding the total sum of $4,575,000 against the City of Eureka and Eureka police officers Adam Laird, Justin Winkle, and Gary Whitmer for the death of Martin Cotton II. Punitive damages were assessed against the three officers. Mr. Cotton, a 26 year-old man living on the streets died of blunt force head trauma. The plaintiffs, represented by attorneys Dale K. Galipo and Vicki I. Sarmiento of Los Angeles County, were Mr. Cotton's 5 year-old daughter and his father. The jury found that Officers Laird and Winkle used excessive force, and that all three officers failed to provide medical care. This link will also bring you to the video-taped interview from after the verdict. Video is also below. The resounding jury decision could not have happened without the years of dedication by Redwood Curtain CopWatch; the courage, strength, and graciousness of Marty Cotton Sr.; the critical solidarity and organizing of the Oscar Grant Committee; the generosity of a few righteous Oakland attorneys; the networking and sharing of resources by Berkeley CopWatch; the bravery of the civilian witnesses to tell the truth; and the sharp, brilliant, hard work from the Cottons' attorneys, Vicki I. Sarmiento and Dale K. Galipo. Closing Arguments on Thursday, Sept 22nd! 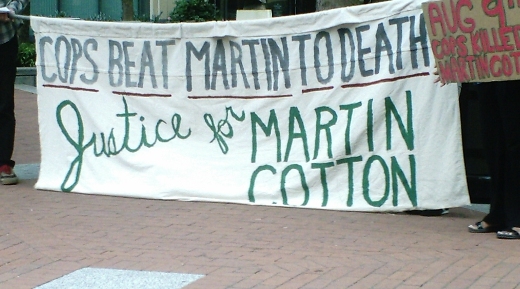 Currently, the civil rights trial about the August 9, 2007 police murder of Martin Frederick Cotton II is in its last few days. The Eureka Police beat Martin Cotton brutally- in fact- beat him to death in broad daylight, in front of the Eureka Rescue Mission and many (other) houseless people. The civil trial, brought by Martin Cotton's father, Marty Cotton, and Martin's young daughter, Siehna Cotton. Tatiana Grant, 5 years old, daughter of Sophina Mesa and Oscar Grant. There has been a civil lawsuit SETTLEMENT for Tatiana Grant, Oscar's 5 year old daughter. Oscar's Mother still has a lawsuit against the Oakland BART cops, as do the 5 young men, close friends, who were with Oscar when he was murdered. The young men recieved abuse themselves and witnessed the cops execute their friend who was laying on his stomach in handcuffs.